I met Ben DeLong through the local woodworking club in Des Moines, Iowa. He’s a talented young man that exhibits a lot of creative detail in his work. Just check out the photos above to see what I mean. Ben understands that box miter joints are typically a weak joint. The end grain of the joint isn’t an ideal gluing surface. So, to reinforce the miters, Ben makes use of spline keys. This is a technique where saw kerfs are cut across the joint at the table saw with the box supported in a jig. Then, spline material is made so that the grain of the spline runs perpendicular to the joint line. The splines are glued into the saw kerfs, trimmed flush, and sanded smooth. But Ben adds some decorative touches to his splines. One technique he uses is to tilt the saw blade on the table saw when making the cuts. This produces an eye-catching, almost an optical illusion, detail to the box. His use of contrasting woods draws the eyes to take in the beauty of the joinery. Another decorative technique is to glue up spline material in alternating bands of various wood species. This produces the “dashed line” effect you see in some of his box splines after they’re assembled. Finally, Ben goes a step further in decorating some of his boxes with appealing inlays. Making small boxes is a great way to hone your woodworking skills whether you’re a beginner or experienced woodworker. It’s a way to use up those scrap pieces of lumber that are just too pretty to throw away. And working on boxes has another benefit. It forces you to take your time to get the fit and finish of the joinery just right. Any errors or gaps in the joinery are sure to be noticeable. It pays to be patient and take your time. 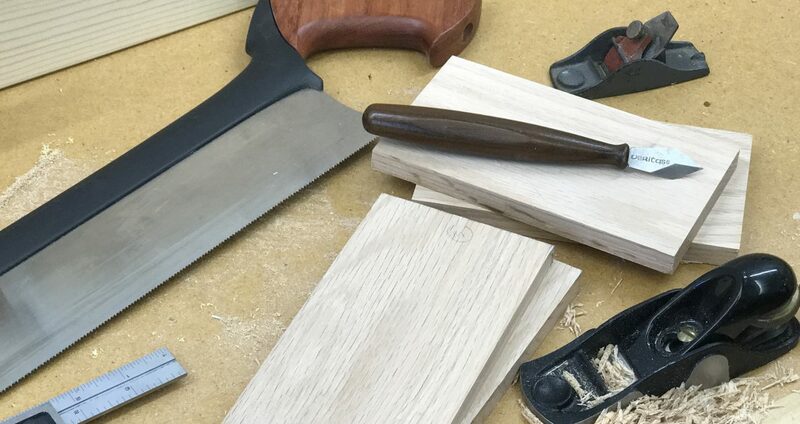 Patience is one of the most valuable tools in the woodworker’s toolbox.